Diet fads come and go so quickly that many of them are gone before we’ve really even learned what they are. One diet that has remained constant at the forefront, however, is tea. Cultures the world over enjoy teas in a variety of different ways. Recently, the health benefits of tea have become a common topic of discussion, and many health companies are boasting a number of diet products that use tea as a main ingredient. More commonly, people are beginning to switch out their soda, juice, and other sugar-loaded drinks for iced tea. The tea is infused into the water, so people believe that it will keep them as hydrated as water does; especially those who simply can’t stand drinking plain water. But what are the real benefits of drinking iced tea? Is it good for you? Bad for you? Is it as hydrating as plain water? Let’s demystify iced tea once and for all. If you are oh so proud of yourself for giving up your favorite soda and switching to tea, but you add a cup of sugar to every glass; you should probably curb your celebration. When you add sugar to your iced tea, you are actually undoing any of the potential health benefits it has and you may as well be drinking a glass of water with some sugar in it. Sugar is a major contributing factor of obesity and diabetes, which is why so many people are making an effort to cut back or eliminate it completely from their diet. Giving up soda is a huge step towards better overall health, but not if you just fill another drink with just as much sugar. Consider using natural sweeteners to sweeten your iced tea; the taste of unsweetened tea seems to be an acquired taste and many people just can’t get themselves to like it, no matter how hard they try. Plus, by using a natural sweetener like honey, you are getting the added benefits of that as well as the benefits the tea has to offer. So What Can Iced Tea Do for My Health? Natural, unsweetened iced tea is loaded with antioxidants which can help your body fight against a number of different things, including age and cancer. Antioxidants are excellent in slowing the progression of old age, and they are incredibly good for your skin as well, meaning that they can help keep you looking and feeling younger. Iced tea has been researched as a possible aid in preventing cancer because of the flavonoids it contains. These target the potentially harmful free radicals within the body and destroy them before they can do any damage. Of course this pertains again to unsweetened tea, since adding sugar makes it difficult for the flavonoids to do their job correctly. The most amazing thing about these flavonoids is that they don’t just target certain forms of cancer-causing free radicals; they destroy them all. One of the main advantages, especially for diabetics, is that unsweetened iced tea helps to stabilize your blood-glucose levels. Maintaining your glucose levels is key for maintaining a healthy blood sugar and it also helps to keep your appetite in check. The body produces alpha-glucosidase, which is an enzyme that regulates how the small intestine absorbs sugar. The absorption rate is what controls the fluctuation in your glucose levels; the fluctuations are often what cause your energy to drop mid-morning if you’ve had a breakfast loaded with sugar. An unsweetened iced tea contains no sugar, and therefore keeps these fluctuations to a minimum. 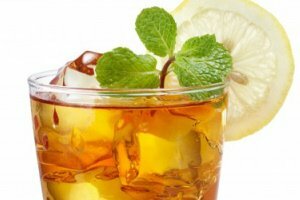 The reason that iced tea suddenly became so popular in the first place is the fact that it is such a low-calorie drink. Many teas are labeled as 0 calories because the FDA has stated that anything with less than 5 calories can be labeled as having none. Even if your glass of tea does have a few calories in it, it certainly does not compare to the 140 that are in one can of coke. Unsweetened iced tea is so low in calories that when combined with a healthy diet and exercise, it can actually help you in your efforts to lose weight. An added weight loss benefit is that a glass of iced tea can help you to feel full without loading you with calories, so you are able to keep your appetite under control. It has also been found that throwing a tea bag into your water bottle to add some flavor still has the same hydrating and thirst-quenching effects as plain water, but you also get the added benefits of the tea. Caffeine, in small amounts can actually be beneficial. Both black and green teas contain a caffeine content that can help boost your mental alertness and concentration. It is also often recommended to people who experience temporary drops in blood pressure when they move quickly or after meals. Of course, too much caffeine is definitely not healthy, which is one reason why sodas are so bad. Iced tea does not have the same amount of caffeine as a soda does, but drinking it all day every day would probably not be a good idea. What would essentially happen is the caffeine would dehydrate you; cancelling out your efforts to stay hydrated with the tea. Because of this, replacing 100% of your water intake with iced tea is not the healthiest choice, unless you are drinking unsweetened, decaffeinated tea. Iced tea, in the right way and in the right amounts can be extremely good for you, and is definitely a better choice than sugary sodas and juices. Completely unsweetened is the best choice, but natural sweeteners are the best option when you need a little added flavor. Research on the benefits of iced tea is still ongoing, and there is even some speculation that it can aid in the prevention of stroke and type 2 diabetes. Perhaps even more benefits will keep being uncovered and that glass of iced tea just might be the next best thing to the fountain of youth. Very good article, add stevia witch is a natural sweetener and you will be on your way to good health. Stevia is a way of fighting Diabetes. How about tropical iced tea that is unsweetened?1. Is there caffeine in tropical tea and 2. Is there any more or less benefits with tropical tea? Very informative. More in depth than any other article I could find. Good article, but it would have been helpful to have added information about the health benefits/detriments of using artificial sweeteners in your tea. Great article, ty, much info!